With the rise of YouTube and social media, public and outlandish proposals have become all the rage. If you’re trying to plan a creative and unforgettable proposal, a flash mob might be the perfect choice. For anyone who has been living under a rock for the past decade, a flash mob is when a group of seemingly random people in a public space, anywhere from a mall to a subway platform to a park, suddenly begin dancing in perfect unison. Technically, a flash mob can be anything that features a group performing an act in unison, so they can range from singing to pillow fights, but choreographed dance routines are their most popular and recognizable form. Lately, they’ve become one of the most popular ways to propose with hundreds of videos posted on YouTube racking up millions of views. It’s a great way to include your favorite song in your proposal. Or if your partner is a lover of musical theater, dance, or huge romantic gestures, it’s the perfect way to create a personalized and unforgettable proposal. One word to the wise though — they are a public spectacle and will draw attention to your special moment, so if either you or your partner hates being the center of attention, then this is not the proposal for you. The last thing you want is for either of you to feel uncomfortable during your special moment. In your most basic planning stages, you should decide on the essentials of your flash mob, and the best place to start is the location. Where will it be? Will it stay in one place or travel, for instance, over the course of an entire neighborhood block? You want to select a place where your future spouse will be in the center of the action and able to absorb the full spectacle of the moment you’ve planned. You can choose a place that has personal meaning to you–maybe the park bench where you shared a first kiss? Or the street outside one of your childhood homes? Or you can select a nondescript public space like the beach or the mall, so that it happens when she least suspects it. When choosing space, consider two things. First, the more public area you choose, the less control you have over the moment and the less privacy you will have. And second, if you choose a highly public space, be prepared to need to coordinate with authorities and double check that you don’t need permits, etc. before finalizing your plans. If you want to use the loudspeaker at the mall that will take much more coordination (and likely cash), than using a boombox in her backyard. 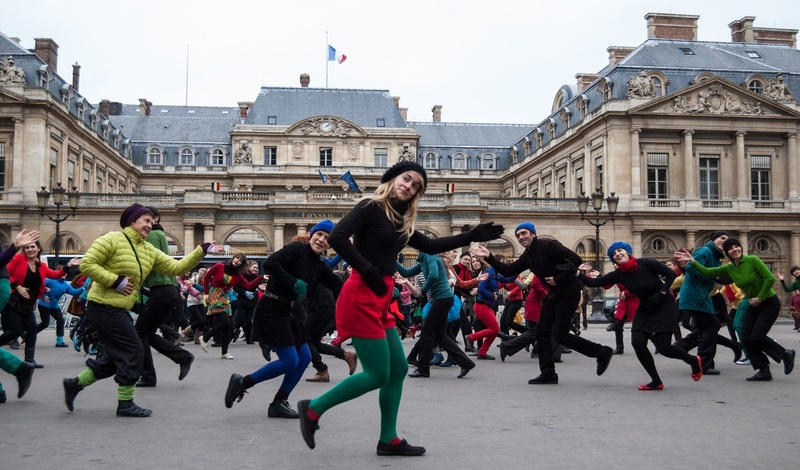 While we will focus primarily on dance-based proposals in this post, remember that a flash mob can take many forms — from a lip-synced dance routine to a live mob of carolers. If you’re think you might want friends and family as the main performers, dancing and/or lip-syncing are probably the simplest options, as they are more likely to pick up a few basic dance moves than they are to learn to sing on-key (or even more challenging, in harmony!). But if you’re part of an acapella group or have musically gifted friends and family members, a singing flash mob is also a beautiful option. If you’re investing in a flash mob company, they can recruit professional singers or a choir to make the moment really sing. Finally, if your flash mob will involve music of any kind that your partner can hear, spend some time considering your options. The song you pick should have personal meaning to you both as a couple. Next, you’ll need to decide on whom you want to participate in your flash mob. Many people like to include their friends and family in their special moment, and this is a great way to make your loved ones feel included, but be mindful that the more people you include, the greater risk there is that she might have the surprise spoiled. If you don’t have enough friends and family (or want to keep them in the dark about your proposal), you may want to consider hiring professional dancers. One option is to contact local dance schools and troupes to see if they can offer you a good rate. Or if you want to reduce the headache and don’t mind spending a bit extra, you can hire a group that specializes in flash mob proposals to do all the dirty work for you. Many companies offer a range of choices from buying a flash mob lock, stock, and barrel, including an organizer. No matter who participates in the mob itself, you will still need a choreographer. Will you design the dance moves yourself and keep it simple or invest in a professional choreographer to teach your loved ones a truly spectacular routine? Both are fabulous options. It just depends on whether you want your flash mob to have the delight of homemade creativity or the polish of professional dance moves. If you’ve already decided to hire professionals or a get a service to arrange everything, you probably have already paid for a choreographer, too. Finally, you will likely want to consider enlisting the services of a videographer. Your intended will likely want to relive this moment over and over, and you’ll want to see it from a different perspective, as well as share it with loved ones for years to come. If you book through a professional flash mob company, they often offer videography as one of your services, but you can also look into hiring a professional on a freelance basis. If all of this is out of your price range, have a family member or friend capture the moment on their phone or video camera. A flash mob is almost like a very complicated surprise party. It needs a well-planned delivery, and this is your “how”. This is the last thing you should and even can plan, as it will be highly dependent on all of the other factors. Whether it’s in your backyard or in the middle of a shopping mall, the timing will have to be coordinated for best effect with the arrival of your partner. Is it easiest to have a friend take them shopping and walk by the location where it will all happen? Or do you work it into your partner’s daily routine? If you have not already involved them all in the routine already, this could be the perfect way to get your other loved ones involved in the proposal. Just make sure, again, that nobody spills the beans. Once that’s decided, you’ll have to work out the cue that sets the whole show in motion. Do you wait for your partner to reach a specific place, look a certain way? Do you get them to pay attention to what you want them to pay attention to by starting no matter where they are looking? Don’t make it too obvious. It’s best when the start to a flash mob is subtle and builds up in a short amount of time. Lastly, be sure to double check that you’ve satisfied any requirements of the location before you put on the show. The last thing you want is for security to shut you down before you’ve ever really started. While some might consider flash mob proposals gauche or attention grabbing, it’s undeniable that they have become one of the most popular ways to pop the question. If you want a proposal bursting with creativity and personalization, a flash mob is the perfect choice.